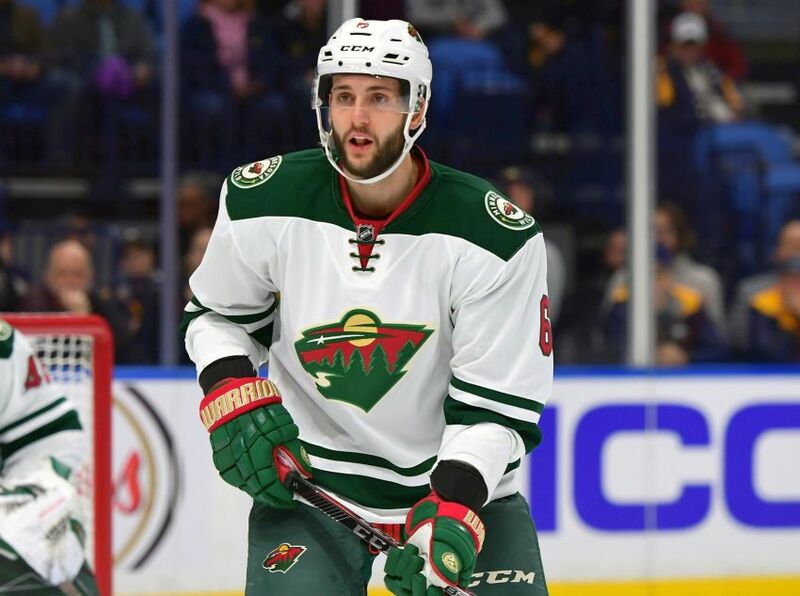 “You always want to have more defense out there,” Botterill said Friday after after acquiring defenseman Marco Scandella and bringing back former captain Jason Pominville from the Minnesota Wild for wingers Tyler Ennis and Marcus Foligno. So after trading for the 27-year-old Scandella, the puck-moving defenseman the Sabres coveted, the team still might add to its defense corps. But Botterill has already significantly improved the blue line, the Sabres’ most glaring weakness. Besides Scandella, Botterill also recently traded for former first-round pick Nathan Beaulieu and signed Victor Antipin, a KHL star former GM Tim Murray worked on bringing over. Botterill believes new coach Phil Housley, a Hall of Fame defenseman and noted talent developer, will bring the best out of those assets. “This is also where we think Phil is going to gel as coach,” Botterill said. In the 6-foot-3, 207-pound Scandella, the Sabres possess a defenseman they believe has growth potential. Botterill wants the mobile Scandella, who will “start our transition game,” to assume a role in the top four, play against the opponent’s first or second line and kill penalties. “We think he’s in a position in his career to really take hold of those big minutes,” Botterill said. Scandella has 27 goals and 89 points in 373 NHL games. He played 18 minutes, 20 seconds a contest last season. He has three years and $12 million left on his contract. The Sabres, of course, gave up assets. They dealt their two longest-tenured players and dished a 2018 third-round pick for a fourth-rounder next year. While Botterill spoke positively of Pominville, they likely had to assume the 34-year-old’s $5 million salary to get Scandella. “You don’t want to lose good, quality people like Tyler and Marcus, but it’s a scenario where we felt we had to improve our defense somehow,” Botterill said. Minnesota GM Chuck Fletcher, one of Botterill’s mentors, said he had been chasing Foligno “for a couple seasons.” Foligno just enjoyed his strongest NHL campaign, scoring a career-high 13 goals while securing regular duty on the third line. Meanwhile, Ennis, who debuted in early 2009-10, is coming off two poor campaigns. The speedy three-time 20-goal scorer struggled as he battled injuries – he had a severe concussion and groin surgery – and adapted poorly to a new system. After mustering only five goals and 13 points in 51 games last season, it appeared only to be a matter of time before the Sabres dealt the 27-year-old. Still, Botterill said Ennis has changed his training routine and the Sabres felt comfortable he could bounce back. “We were extremely comfortable bringing Tyler back,” he said. Ennis believes Minnesota coach Bruce Boudreau’s high-tempo system is tailored to his talents. “I’m ready to be the player I was a few years ago,” said Ennis, who has two years and $9.2 million left on his contract. Ennis should feel comfortable in Minnesota. The former first-round pick will be joining his best friend and childhood neighbor, Wild defenseman Jared Spurgeon, and also have Foligno, another close friend, with him. The Buffalo-born Foligno debuted in 2011-12 and had been a regular five seasons. The affable 25-year-old occasionally showcased the talents of a power forward. Still, he struggled with his consistency for years. In the last season and half, however, he became one of the Sabres’ better forwards. “It was a great ride,” Foligno said. Like Ennis, the move is bittersweet for Foligno. Expect the Sabres to make more moves today when free agency opens at noon. Pominville’s acquisition could mean 38-year-old captain Brian Gionta isn’t brought back. Botterill, however, wouldn’t rule out Gionta’s return. He plans to keep talking to Gionta’s camp. “I’m well aware of … how valuable Brian can be,” he said. Botterill said the Sabres will likely stay away from high-profile, expensive signings. He expects to have more trade talks and pursue positional players in free agency. “Finding the right fit versus the big bang,” he said. The Sabres took on some salary Friday and have $19,862,559 of cap space, according to capfriendly.com. “We’re fine right now,” Botterill said of the Sabres’ cap situation. But the Sabres will be adding bigger salaries soon. They have five restricted free agents, including starting goalie Robin Lehner. They also want to extend star center Jack Eichel’s contract. Botterill said he has been talking to their agents. He believes a deal with Lehner can be done in the next month. He spoke optimistically of locking up Eichel. “When the time is right, I’m sure we’ll be able to get a deal done,” Botterill said. Scandella had 5 more points than Justin Falk, in 19 more games. He doesn’t seem like an upgrade…I’d rather pay $3M for Kevin Shattenkirk. *$3M MORE for Shattenkirk, is what I meant.